Girls, more than women or boys, lack access to financial capital and have limited opportunities to gain education, knowledge, and skills that can lead to economic advancement. Inadequate policy frameworks and inequitable gender norms also often create barriers to girls' economic advancement. For a sound financial strategy, it is important to link workforce development and employment strategies with market needs and opportunities. We recommend that programmes offering vocational training and employment opportunities should include these initiatives to match market requirements and opportunities. This approach not only requires designing a quality training process that builds girls' technical and soft skills, but also enlists the commitment of employers to hire participants. Workforce development and employment strategies are critical to helping girls lift themselves and their families out of poverty. Although adolescent girls primarily enter the workforce to support their families financially, studies have shown that they also value mobility, opportunities for friendship, and greater autonomy that may come with employment. Therefore, safe and appropriate employment opportunities can strengthen their economic status, while improving social welfare and future job prospects. Despite the clear benefits of investing in employment opportunities for girls, the global economic crisis has created serious challenges for youth employment. According to the International Labour Organisation's 2012 report, the global youth unemployment rate has risen since 2007 and medium-term projections suggest little improvement in the next few years. Further, macroeconomic conditions create particular challenges for adolescent girls, who experience greater rates of unemployment compared to boys in nearly every region of the world. 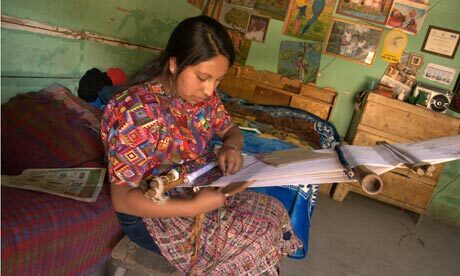 A Mayan adolescent girl in Guatemala. Girls experience greater rates of unemployment compared to boys in nearly every region of the world. Given these challenges, vocational training can play a key role in helping girls get jobs. Vocational training typically includes development of technical capacity, entrepreneurship, and business skills. Ideally, vocational training is demand-oriented and builds specific skills tailored to prospective employers' needs. Other vocational training programmes help girls build a wide set of soft skills, such as conflict resolution, team building, and communication, which they can use in a variety of jobs. While soft skills may complement demand-oriented training, research demonstrates that the success of vocational training depends primarily on programmes' ability to target and help girls develop the actual technical and business skills needed by employers. Beyond tailoring vocational training programmes to employers' needs, evaluations demonstrate the importance of establishing formal commitments from them to hire participants. Research suggests that job placement rates are higher for vocational training programmes that are able to secure hiring commitments from participating firms and other corporate partners than programmes that do not establish these partnerships from the outset. Girls' economic empowerment not only depends on availability of jobs, but also on protective policy environments and community-based support for their entry into the workplace. Advocates and policymakers must ensure that laws promote gender equality in the workplace and incentivise employers to create girl-friendly work environments. Consider these two case studies. The World Bank's adolescent girls initiative in Liberia promotes productive employment and economic empowerment through technical skills training. The initiative provided technical training in skills identified by prospective employers, and secured job placements for graduates in catering, painting, driving, and professional cleaning. While the final evaluation is not yet available, a survey showed that participants experienced a 50% increase in employment and 115% increase in incomes. In contrast, results from the New Work Opportunities for Women programme in Jordan are less positive. This initiative offered vouchers as an incentive for firms to hire young female graduates who had been trained in business and professional skills. Although 300 women were hired initially, employment rates for participants dropped just four months after the programme ended. These findings suggest that gender inequality created a workplace environment that was hostile to young women, making them unable to continue their work. This case study highlights the importance of a protective policy framework guaranteeing the rights of girls and women in the workforce, and the need for vocational training to collaborate with employers to ensure that workplaces are supportive of young female employees. In addition, policymakers and practitioners must recognise that although adolescent girls around the world are among the most marginalised members of their societies, they are far from homogeneous. It is important to develop initiatives that respond to the diversity of girls' lives and experiences, across age groups, ethnicities, and abilities. While it may seem obvious, the economic capacities and needs of a nine-year-old girl are drastically different from those of her 15-year-old sister. Similarly, economic empowerment initiatives must address the needs of girls living with physical and learning disabilities.